The Ultimate Guide To Jewelry Making for Beginners. 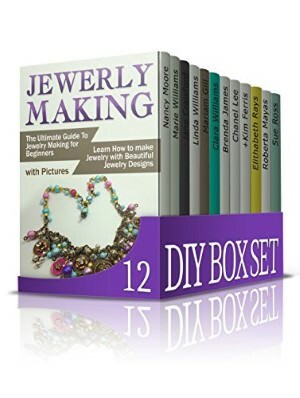 Learn How to make Jewelry with Beautiful Jewelry Designs. There is nothing more satisfying, prideful or pleasing than making your own jewelry. It gives you the right to choose the design you want and also the choice of beads, which you feel describes your style more. DIY Candles: The Ultimate Homemade Candles Guide - Candle Making For Beginners. Master Making Luxurious, Natural Candles At Home From Scratch. Candles are relatively cheap and easy to find on the market today. Because of that, why would anyone want to make candles? For some, the pleasure comes from making something they find meaningful or useful. The Ultimate Container Gardening Guide: DIY - How to Grow Air-Cleaning House Plants, Flowers and Organic Vegetables at home. The Ultimate Container Gardening Guide is a very resourceful book that will provide you with plenty of information and gardening tips to introduce beginners to the practice and also improve the skills for those already embracing this noble practice. Master the Art of Crochet in 1 Day with Easy Crochet Patters for Beginners! Outstanding Crochet Projects. This book tells you almost everything you need to know about crocheting world like patterns, stitches, tool etc. Crocheting is an easy thing to learn so have fun as you start and I bet you will love it. The Ultimate DIY Guide on House Cleaning, Organizing and Productivity. Learn Smart and Easy Tricks on How to Clean and Organize Your House in 3 Days. This book talks about easy ways to clean your house be it the living room, kitchen, bedroom and even your bathroom. You will learn how to organize your shoes, kitchen utensils, learn about different cleaning products you can use to clean different type of surface around your house. 28 Amazing Easy to make Homemade Christmas Gift Ideas and Home Decoration Ideas for Winter. The ideas in decorations provided in this guide are all home made. The Ultimate DIY Pantry Guide to Lemon, Baking Soda, Peroxide and Essential Oils. Life Saving DIY Pantry Tips. The book informs you why lemons, hydrogen peroxide, baking soda and a number of essential oils discussed are a must have in your DIY Pantry. The Ultimate Indoor Gardening Guide: Best Way to Grow an Indoor Vegetable Garden - Grow Vegetables and Herbs.Whether you are a typical vegetarian or just a person who enjoys fresh green vegetables, having an all year round, all weather supply of fresh vegetables could be a dream. Master the Art of Knitting in 1 Day with Knitting Instructions. BONUS Chapter with Knitting Techniques included! Learn How to Knit fast step by step. The Ultimate Quilting Crash Course: Learn Basic Quilting Techniques Master The Art Of Quilting And Start Creating Amazing Designs. Are you looking to start a new, interesting hobby? If the answer to any of these questions is “yes,” then this is the book for you! Learn to Sew with 7 Simple Sewing Patterns.